By now many of you know that I decided to hang up my SCPCUG Web Master hat. I was first elected SCPCUG Web Master in April 1998. After five years it is my good fortune that Catherine Hall came along and is willing to take on this demanding job. It is also with some pride I look back on these past five years and realize what a web site I have built! When I first took on the job of Web Master the site was essentially in black and white with very few graphics and even less photos. It numbered around 31 pages. We now have over 78 pages. At the right is the SCPCUG Home page from April 29, 1998. We did not have our own domain then and PalmNet was providing us web hosting. My past Web Master Wanderings columns have covered a variety of subjects and for the most part were based on whatever new program I was trying out, computing problem I was having, or simply whatever interested me at the moment. My philosophy has always been to help share my knowledge and experience in the hope that it would help others. Guess that gets back to the SCPCUG logo saying of "Users Helping Users." Although I am leaving the Web Master position, I plan to continue being listed under Helplines in the Space Coast PC Journal and will be available to help members with their Internet/HTML and Windows 98/ME questions. Speaking from personal knowledge I know that computers at times can be quite unfriendly. I am happy to have helped many members over the years. It is very satisfying to know I have in some small way contributed to the successful solution of another's computing problem. I am by no means an expert. Many times I did not have the proper knowledge to solve the problem but the SCPCUG has many members with knowledge in different areas of interest. By knowing of the experience and knowledge of other members I could usually point an individual with a problem in the proper direction for an answer. That in itself is a valuable benefit of membership. So enough reminiscing. In this my last Web Master Wanderings column I want to share more of my computing experiences and personal opinions with the hope of helping you the reader gain more computing insight. Last year my daughter Jill gave me an old 466 MHz Celeron computer with 17 inch ViewSonic monitor (pictured here with a 15 inch monitor) as a birthday present. To me this was the perfect present. It gave me a great learning tool. I could experiment all I wanted without the fear of messing up important data or programs. At the time, the company she was working for had been caught in the economy crunch. They were rapidly downsizing and consolidating. As a result, they were selling off some of their assets to employees at bargain basement prices. So this is how I acquired this micro tower computer with 128 MB PC66 SDRAM, 3 PCI slots (one filled by a network card), no AGP slot, 10 GB hard drive, 48x CD-ROM drive, floppy drive, no sound card, and no modem card. It had mini jacks on the back below the USB ports for Spkr, Mic, and Line-In, but when I went to Control Panel I found everything for audio grayed out. Windows 95B (OSR2) was installed which negated use of the USB ports. It looked to me like a prime candidate for upgrading, although with only one empty 5.25 inch front panel bay and only two empty PCI slots on the back, new component expansion would be somewhat limited. The first thing I did was open the case in an effort to get motherboard information. This in itself became my first challenge. The case was sealed with a special screw and several stickers which if broken voided the service warranty. The warranty part was of no concern as it was already invalid due to the computer's sale. But the screw removal was a problem. I was forced to drill it out while paying careful attention not to get any metal shavings inside the case (potential for a future short circuit). Upon removing the case all I found on the motherboard was a model number (S381-M+) but no name. Armed with this information I went to the Internet and looked up the name of the company that had assembled and sold the computer for industrial use. There I found a listing of the various computer configurations they lease and supply to industrial companies. By matching the model number I was able to find that Tekram made the motherboard. (Just that feat would have been next to impossible before the age of the Internet.) Going to the Tekram web site (http://www.tekram.com) I was able to download the Installation Guide and the BIOS, Driver & Utility Guide. All the motherboard driver files and various motherboard utility programs were also available for download. SCPCUG First Vice President and resident GURU David Nottingham was kind enough to endure a 334 MB Tekram download and burn a CD-ROM for me with all the info I would need. (Dave's on Broadband and I'm on Dial-Up.) I found the motherboard had been made in 1999 and was no longer being sold. 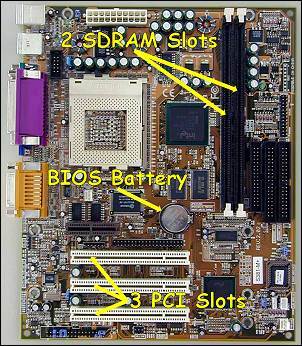 It has Audio Codec 97 (AC97) sound on board and the video is also integrated on the motherboard. Due to my lack of knowledge it took me a while (again through Internet research) to find out that the AC97 integrated sound did not work because the computer was running Windows 95. AC97 sound provides a way for manufacturers to reduce computer costs by eliminating the need to include a separate sound card. It did not come into existence until 1998 (after Windows 95). Another challenge that presented itself was getting the Celeron computer to talk to my other computers. Again, I relied on the Internet to find the network card manufacturer Encore (http://www.encore-usa.com) and download the latest drivers and associated information. But even with that I could not get networking up and running. I played for a week configuring the network card. Finally, I called on my son Chris who has much networking expertise. After several hours he had it working. The secret was to completely remove and reinstall the card and then reinstall all the drivers. Even with that I was now getting three files that Windows could not find on boot-up. They appeared to have something to do with NetWare which may have been the previous protocol used in the industrial environment. I solved that problem by finding the answer on the Internet in the Microsoft Knowledge Base (http://support.microsoft.com/). I had to add and then remove Microsoft Client for NetWare Networks which cured the problem. Apparently Windows had been telling me that something still on the machine in the Registry or the System.ini file was referring to a device file which was removed when we removed the card. Continuing on, I now had two choices. Either add a sound card or upgrade Windows. I decided to upgrade rather than fill another PCI slot since they were in short supply. Also I wanted USB capability which required an upgrade. Now do I delete everything and do a complete install from a clean drive or do I upgrade from Win95B. I decided on the latter as I felt I would learn more by first trying to remove these industrial programs. So back to the Internet I went, researching file names, to try to figure out what these programs actually did and maybe get some idea of what files needed to be removed. I found some of the programs were no longer being sold and any information at best was very sketchy. A free (for personal use) program that came in very handy in telling me exactly what programs were installed on my machine was the Belarc Advisor (http://www.belarc.com/). Belarc Advisor has been a link for quite a while under Computing Help on our SCPCUG General Information Links page (http://www.scpcug.com/infolink.html). Norton CleanSweep (now part of Symantec's Norton SystemWorks at http://www.symantec.com/sabu/sysworks/basic/) also proved most helpful in analyzing the installed programs and helping me remove as many as possible. My problem was that some of the programs were not listed in Control Panel's Add/Remove Programs list. My intent was to get the hard drive as clean as possible without removing the Windows 95 Operating System. Before upgrading I cleaned the Registry using Norton CleanSweep and then ran ScanDisk and Disk Defragmenter. I was now ready to upgrade but for safety sake decided to backup what remained on the 10 GB hard drive to my Gateway computer via the network connection and then burned the data on to a CD-ROM. The upgrade to Windows 98SE went smooth as could be. After that I activated the USB ports in the BIOS and installed the Win98SE sound drivers downloaded from the motherboard manufacturer. My Celeron computer came alive! I finally had sound! I temporarily used an old stereo receiver's amplifier and speakers until I came across a great deal from Staples and got a $40 Altec Lansing AVS300 3-piece speaker set (two satellites and a woofer) for $10 after rebates. At the same time (also from Staples) I got a 56K V.92 voice/fax modem for free after rebates. Who said you can't outfit a computer cheap? I had no prior experience with AC97 sound and had always heard if you wanted the best sound for MIDI, get a soundcard with WaveTable Sampled Sound. To my surprise this AC97 sound relies on a software version of Roland Sound Canvas digital samples. Granted it does not compare to the MIDI sound from the SoundBlaster Live card in my 1 GHz ABS Technologies computer but it is decent enough for a someone not an audiophile. Another surprise came when I tried to convert the 10 GB drive to FAT32. The Drive Converter program in Win98SE told me the drive was already formatted for FAT32. I had thought FAT32 came into existence with Win98 but it must have been with Win95B. Moving right along, I next added a second hard drive. I had a used 3 GB hard drive sitting on the shelf for several years. It had been removed from my old Gateway computer when I upgraded that computer's second drive to a 8 GB hard drive. So I decided to put it to good use. I soon discovered that working in the cramped quarters of a micro sized case is a real challenge. A second hard drive had to sit vertically on edge behind the lower front panel and be stacked parallel to the original hard drive in its internal drive bay. Once installed, there were no internal bays left. On the front, the top bay is used by the 48X CD-ROM drive and a second bay below it is empty but hard to get to because of the top bay being occupied. If I were to add a CD-RW drive I would be out of room there also. Such is the limited expansion capability of these micro sized cases. This is a very important consideration when buying a new computer as many new computers you see in the stores use a micro size case. Sure it looks good because it's small. But working on it is difficult and consideration must be given as to what future components might be added. All was going well when I noticed that the clock in the System Tray on my DeskTop was losing time. That is usually a sign that the BIOS battery on the motherboard needs replacing. Mine was a very common type, a 3 volt Lithium disk type model CR2032. I had always heard since my Windows 95 days that before changing the BIOS battery be sure to write down all your BIOS settings so as not to lose them. So I dutifully used my Sony Camcorder and the video capture card in my ABS Technologies computer to take 21 photos of the BIOS screens. After I changed the battery I went back into the BIOS and was pleasantly surprised to find all the settings were identical to what I had before. I knew for a fact that these were not the factory default settings because I had made some changes. At first I thought maybe motherboard design had improved and a circuit added to keep the settings during the minute it takes to change the battery. However, a PC Mechanic article on CMOS Backup Battery at http://www.pcmech.com/show/motherboards/80/ states "If you're really fast, you may be able to replace the battery and not lose any settings. There will be a residual charge left in the CMOS that MAY hold the data for a few minutes." But they still recommended having a backup of your settings. Anyway my clock now keeps good time and periodically I sync it for perfect time using the NIST Internet Time Service (http://www.boulder.nist.gov/timefreq/service/its.htm), another link on our SCPCUG General Information Links page under the Reference section. Never being one to stop tweaking, I next partitioned the computer's original 10 GB hard drive into seven partitions using PowerQuest's Partition Magic (http://www.powerquest.com/). 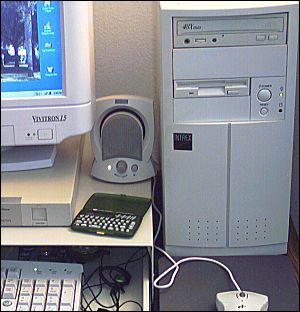 I had grown used to the segregation that partitioning allows with my Gateway computer and decided to do the same for this Celeron computer. I did have one moment of "panic" in the partitioning process. After instructing Partition Magic as to how the hard drive was to be partitioned it is necessary for the computer to shutdown and reboot. The magic is performed during the boot-up. Well on shutdown the computer hung. The screen was frozen and the mouse would not work. I had to go to the 3-finger salute (Control+Alt+Delete keys pressed at the same time) to get it to shutdown. I was now not sure if it would remember the partitioning instructions given it before shutdown. I wondered if I would have a working computer on boot-up because normally with an improper shutdown, Windows 98SE wants to run ScanDisk on boot-up. How that played into the equation was an unknown. As it turned out, all went well. Partition Magic did its magic in DOS first, and when Windows finally booted I had a nicely partitioned drive. Such are the adventures one encounters in computing. I leave you now with this one last photo recently taken by SCPCUG Club Photographer Robin Mills. 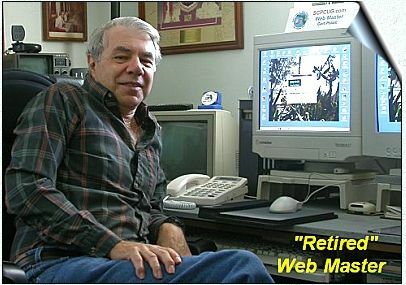 After writing more than three dozen Web Master Wanderings articles over the past five years it is "time for a change." Our new Web Master Catherine Hall has graciously agreed to continue Web Master Wanderings. I am most eager to see what Catherine will write about and will certainly enjoy getting a woman's perspective on this computing world. Bye!